As 4K-resolution cameras falling into consumers’ hands, the need for editing 4K video has moved into the mainstream. Adobe has done a lot of work with Premiere Pro: Premiere Pro CS6 and CC have gained features- native support for footage from 4K-resolution camera systems: the Red Epic, the Red Scarlet-X, the ARRI Alexa, etc. So, what does 4K video to Adobe Premiere Pro workflow look like? Learn the Full 4K raw editing with Premiere Pro. 4K footage looks amazing but usually it can make video editing a real nightmare. You may get a latest 4K camera like the Blackmagic 4K, Lumix GH4, Lumix GH5, DJI Phantom 4, Sony FDR AX100… meanwhile your computer freezes when editing 4K video in Premiere Pro. Granted, Premiere Pro CS6, CC can handle (usually) 4K files without much problem, but it is extremely hardware intensive. Thankfully you probably don’t have to buy a new computer… but you do need to convert 4K video to Premiere Pro using MPEG-2 (1080p) as primary delivery format. The following paragraphs show us how to edit 4K footage with Premiere Pro without bogging down your computer. 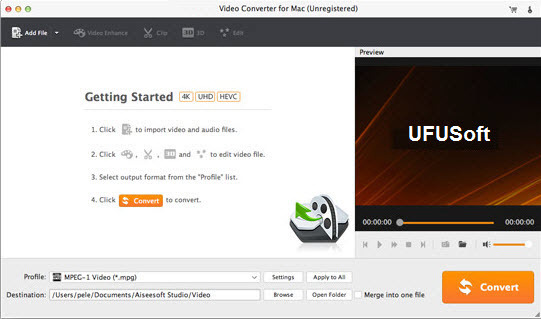 The process is surprisingly easy and can be done with the help of UFUSoft 4K Video Converter for Mac. With it, you can effortlessly encode/re-encode 4K H.264(MP4, MOV), XAVC, XAVC S, etc footage for smoothly importing and editing in various non-linear editing systems (NLE), including Adobe Premiere Pro, Avid Media Composer, Final Cut Pro, iMovie, FCE and more. If you work 4K files in Adobe Premiere Pro on Windows PC, please get 4K Video Converter to solve the issues. How to import 4K video into Adobe Premiere Pro? 1. Add raw files > Launch the 4K to Adobe Premiere converter, then drag & drop the 4K files onto the main interface, or you can click the “Add Video” button to locate the videos from your local disk. Batch conversion is available here, so you are allowed to import several files at one time. 2. Choose output format > The program has three already optimized the video settings for Adobe Premiere. You can select MOV, WMV or MPEG-2 from “Editing Software” as the output format. All output videos will seamlessly fit Adobe Premiere Pro CC, CS6, CS5.5, CS5, CS4 and more. Here we recommend you choose MPEG-2. Tips: Click “Settings” button if you’d like to customize advanced audio and video parameters like Video Codec, aspect ratio, bit rate, frame rate, Audio codec, sample rate, audio channels. 3. Start converting 4K footage > When everything is ready, simply click the big “Convert” button and the program will start transcoding 4K videos to MPEG-2 files. Soon after the conversion, just click “Open” button to get the generated files for natively editing in your Adobe Premiere Pro CC, CS6, CS5.5, CS4 or CS4.